Shevchenko: I�m Nicolay Leontyevich Shevchenko. Deputy Chief of veterans� council of Air Force academy named after N.E. 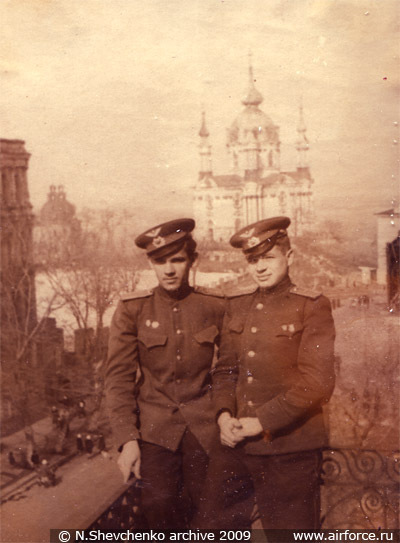 Zhukovskii and Yu.A. 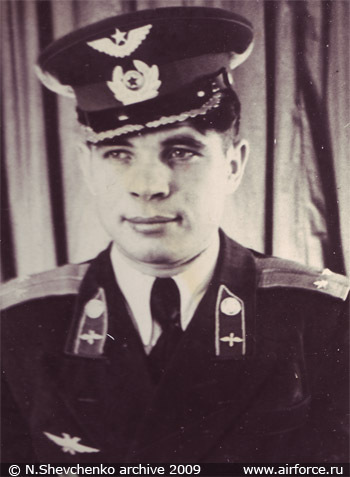 Gagarin. Veteran of combat action in Vietnam. Fighter pilot with a flight experience of 27 years. Had mastered 15 airplane types. Had participated in flight experiments with combat use of Sukhoi aircraft. PhD. associate professor. Author and co-author of 64 scientific articles, textbooks and monographs. Prepared 8 Philosophy doctors. Colonel. � When and where you were born? I was born on 1 January 1930. My parents were kolkhoz members. Father was a tractor driver, mom worked as a handyman. I was born in historic place. I understood it only now. I like history, and study it. There is a hypothesis, that Russia begun from Ross�: at the place where I was born a little river Targan is joining river Ross�. In the delta of Targan river there is a village Parkhomovka. That�s 100-120 kilometers to the south from Kiev towards Odessa, just a bit off to the side from the road. This village is famous for its three-cupola church. Height of the cupolas was 75 meters. It was decorated by Nicolay Rerikh. In the following 2-3 years village had changed. Restorers came not only from Kiev, but from Moscow too. � You are barefooted, I can�t take you. � How did you find out that war begun? What were your feelings? Tensions began a week or two before. A command came in to destroy crops. They were rammed to the ground. To be sure that Germans won�t have it. But our village was in a secluded place. When war begun our troops were retreating, a lot of soldiers stayed in our places, some got married. Germans didn�t touch them. � What life was like during occupation? � Nikolai, let�s go, we need a horse. If there will be a horse, we will stay alive. There was a lot of no one�s livestock on the fields. So we went and caught a horse. So I had to take care about horse and cow. � Was there a German garrison in your village? Before war I graduated from 4th grade. I continued my education only after liberation in 1944. Front moved over us, and I continued to study in Parkhomovka, by shortened program I finished 7th grade. � What did you write on? I had a notebook made of German bags � we cut them into fitting pieces. And no textbooks at all. � You are late, we are full. � Let�s go to artillery school. He guided me to artillery school, I showed my marks there. They were ready to accept me, but I intuitionally didn�t like artillery. Then we talked about aviation schools. They told me that there was one in Kiev, and that there was no need for me to study in Leningrad. I returned home, and continued to study in 8th grade. That�s how I failed to become a sailor. Now I decided to become a pilot. � In a newspaper there is an article where you should go � Special school of the air force. There was another reason that made me go there � our local school was closing. There simply were not enough pupils. Those who decided to study were transferred to a school in Volodarka. But to study there one had to have boots and clothes. I had none of those. So I decided to try and apply for a place in Kiev Special School of the Air Force. There were exams: Dictation, math. I am a Ukrainian, while all studying there was done in Russian. But I was accepted to 9th grade. Studying in Russian caused a lot of problems. At first I had 5s only for Ukrainian language. I even received prizes. � And what about your village school? There was a Russian language subject, but all other lessons were taught in Ukrainian... To learn how to think in Russian, one needs years. At first my friend was a translator for me. � How was you dressed and fed in school? We lived in barracks. School dressed us and fed us. We were dressed well, but food was in short supply at first. Ration: in the morning � 500 grams. I ate it before I got to the third floor. Cabbage for dinner and a bucket of tea for four for supper. I remember that in 1948 there was a monetary reform, after which we were fed excellently. I found out what was butter, rice, white bread. I was also in training camps. Most important for us was physical training. In the morning we ran 1000 meters. After it we swam across river there and back. There were 5 hours of training per day. We were very well trained. But a lot of pupils were expelled from special school. � By which subjects your school differed from usual? In 1949 I graduated from school and was sent to Bataisk VAUL named after Serov. We didn�t have to pass exams. Kiev school had an agreement � almost all graduates were sent to fighter schools. Very few became bombers. But out of 120 graduates only 55 came to Bataisk. All others were not accepted due to health problems or other reasons. As usual, there were people with pull. It was a good school: food and clothes for free, best teachers, and this is why such a people sought to get there. They were using their connections to enter the school and leave it later. Only one half remained. I keep looking after such questions even now, as there are such schools now. Nowadays only 20% stay in aviation� Special schools are very costly for the state� We have to change acceptance criteria. We should teach not the �sons�, but those who are like I was � barefooted. They will always be loyal, they will learn and become pilots. For us becoming a pilot was not even a dream, and we got such a chance! � I don�t need your 10th grade. I�ll go to financial career or become a lawyer. You can�t be in aviation without loving it� I flew fighters �upside down� for 27 years. It�s not easy� It wasn�t cloudless. Anything happened. But I loved it. � What you remember from studying in VAUL? What it begun from? It started from theoretical battalion, and then we flew in a training regiment near Novocherkassk. � A �young soldier�s course� at first? � Were you used as a workforce? � Were there GPW veterans in the flight school? What can you tell about them? There were a lot of veterans in the school. 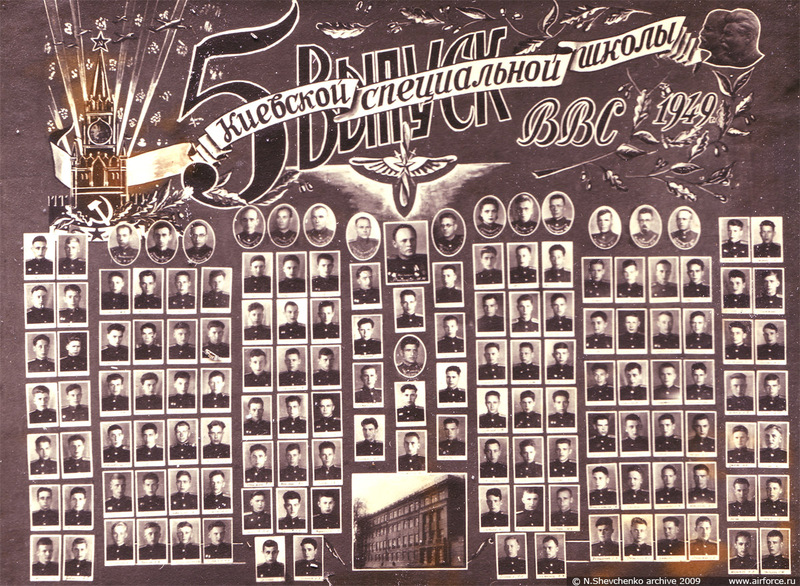 In our company there was detached 9th teaching department, equipped only with veterans. Those were former gunners, radio operators and technicians. They with great respect studied, all graduated and successfully served in the armed forces. 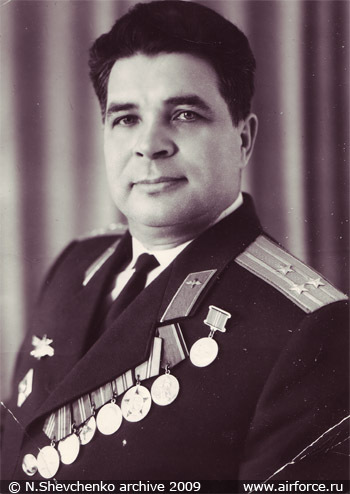 Graduates from Bataisk school were famous in our country, as an example, Maresyev �lexey, HSU, colonel, PhD, honorary citizen of many Russian towns; Marshall of aviation Skomorokhov N, Twice HSU, PhD, professor; General-Colonel of aviation Dolnikov G., Military Pilot Emeritus, PhD; General-Major of aviation Bezhevez A., HSU, Test Pilot Emeritus. � When you were sent to training regiment? Can�t say precisely� Somewhere in the beginning of 1951. � What type of airplanes you flew? Yak-18. I still remember my first impressions. I was appointed as a commander of a flight group. Each instructor had a flight group of 5-7 cadets. My first instructor was Zuikov. Before starting training of cadets, instructors in the spring fly training flights themselves. He took me instead of a sandbag into rear cabin, and flew a training mission. We made 6 flights together. I felt so sick, that I decided that my flying career was over. �Which planes you flew later? Then we mastered transition airplane Yak-11. By its flying characteristics and construction it was very different from Yak-18 and was closer to La-9 fighter. In those days to become a graduate from our school and receive a profession �pilot-technician� we had to master three types of aircraft. 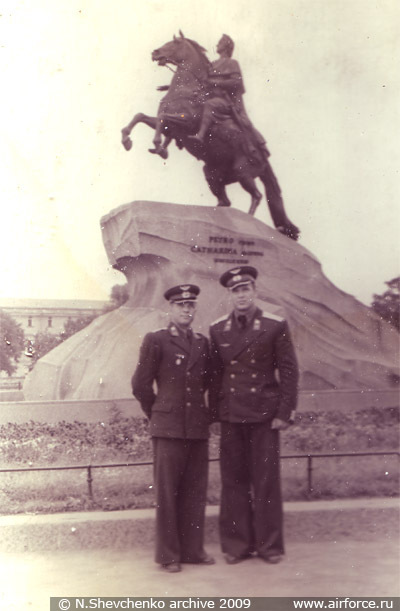 Instructors were Eduard Gazkevich and Anatolii Shevchenko. We flew near Novocherkassk and Azov. � How would you describe La-9? 5 of us begun training, only 2 finished. One, from my group, had broken 4 planes on taxiing, and still couldn�t master La-9 on landing, but he was willing to fly so much, that he was left in the school to train straight on jet fighter MiG-15, which he mastered well. I met him in Kramatorsk. 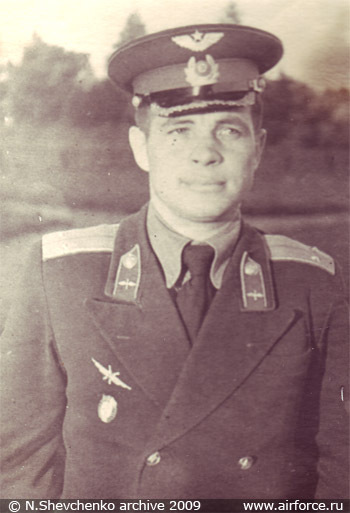 He was a squadron commander then and flew Su-15. It was nice to meet him. But he couldn�t fly Lavochkins, because they demanded high leg and hand coordination. If stick was pulled a bit too hard, it banked on the wing, which had to be later repaired. Pilots were excluded from school on the period of La training. � Who flew Lavochkins has nothing to worry about in MiG-15. � You graduated from flight school in 1952. Where you were sent? To Tapa, in Leningrad military district, that�s Estonia. To 656th fighter regiment. � How this regiment was equipped? Regiment was of reduced strength. People came from Korea. 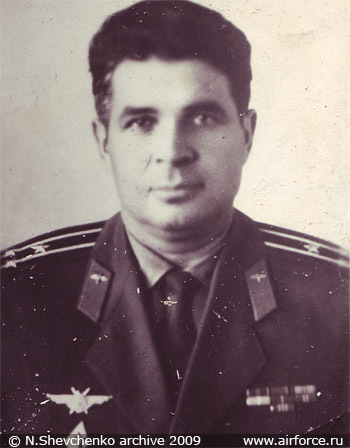 Regiment commander was Major Mikhailov. Regiment was a part of a Corpus, its commander was Gil�. I remember this surname. Lenin�s driver was Gil�. � What was the attitude of local population towards our pilots in Estonia? � When you came to combat regiment, you begun flying on MiG-15 UTI or on a fighter straight away? 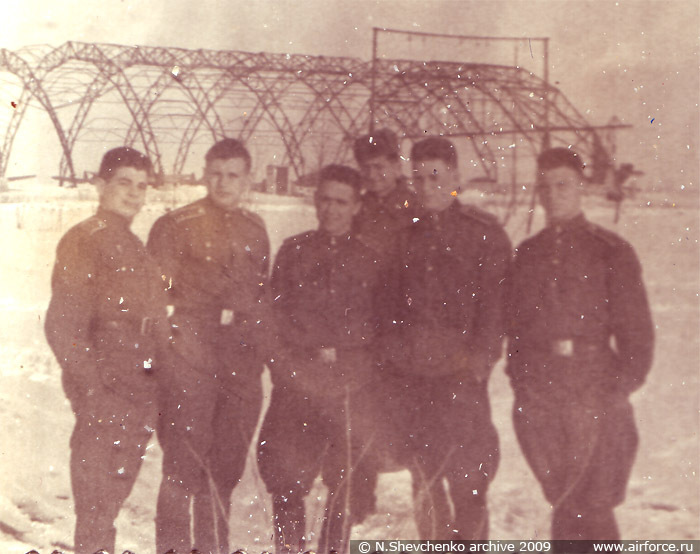 There was a twin-seater � UTI MiG-15, and six men were taught in the regiment. Others had to train in Kyzyl-Arvat. � For you personally which plane was easier to fly: MiG-15 or piston-engine? It�s the same in civil aviation, everywhere the same. And those, who do not feel the ground, who do not have this special feeling, are written off. � Landing speed on MiG-15 was much higher? Of course landing speed on MiG-15, comparing with Lavochkins, was higher � 300-320 km\h. � How long you were in this regiment? For 2 years. 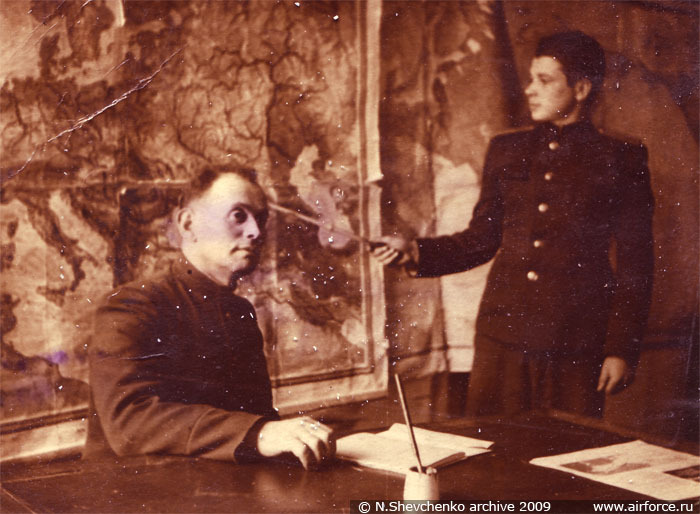 Then VVS regiments were transferred to PVO, so I was transferred to Leningrad 6th PVO Army to Karelian Isthmus. Veshevo AB near Vyborg. There was such a great fishing! � How many flying hours average pilot had in your regiment? Average� If flights with instructor are not included, 100 hours for a pilot. Beginner pilot could have a bit less, 80-90, commander 150�160 hours in a year. � Is it enough? Wouldn�t 300-400 hours be better? For each plane type there should be its own satisfactory flight time. For transport or bomber aviation it could be 300-400 hours, for ground attack planes and fighters 120-150 is enough. For example I had to fly down south in a Su-9 in July. Most flights were made for top speed or top altitude. They all were performed in hermetic helm. Flight lasted for 35 minutes. Make 3 flights per day � and loose 1,5 kilogram of weight, while you gained only 1,5 flying hours. Those were difficult flights. � How much time was given for pilot practice and for combat training? For different planes different time. Approximately 35-40% - for flying practice and 60-65% - for combat training. � You came to the regiment as a Lieutenant? � You were transferred to PVO regiment as a pilot, or a senior pilot? Senior pilot, later I became a flight commander. � What was the difference between training in PVO and VVS units? Training of PVO and VVS was slightly different. The differences were defined by types of weapons utilized and main tasks of the units. Main task for VVS is a cover of ground forces and striking against enemy troops for benefit of ground or naval forces. PVO is tasked with covering VI objects in the rear. � Did you meet KW veterans? What did they tell you about that war? In the skies of Korea our MiG-15 met newest American fighter F-86 Saber. Both planes were very similar, engines of almost identical power, but our MiG was much lighter, and that�s why it surpassed Saber in rate of climb and maneuverability. Besides, firepower of MiGs cannons was much more effective than that of Sabers 6 12,7 machine guns. Famous B-29s also couldn�t escape from MiGs fire. We also suffered some losses, especially in the beginning of war. � How combat experience was passed to young pilots? It was organized by seminars, re-enactments, description of episodes at books and training courses. � Did you fly real combat missions? � By spring you have to fly in complex weather condition at night. � Did you shoot any balloons down? No, I don�t. You know, it was difficult to be sure that balloon was shot down. You pierce it, it descends and moves far away. Enemy planes didn�t fly in our area of responsibility. � What was armament of your MiG-19s? � MiG-19 for a long time suffered from Teething problems. � When you begun flying MiG-19? � For how long you were in Leningrad PVO? Until 1958. Then I studied in the Academy. � You mastered T-3 before or after Academy? After. I came there as captain, studied for four years and graduated in 1962. � And where you were sent then? To Ovruch. That�s on the Ukrainian-Belorussian border. � What was your rank and post in this regiment? Yes. And I was sent to train on Su-9 immediately. � Did you fly Yak-25s? No, I didn�t fly it. � Your opinion about Su-9? Very complex airplane. Lavochkin was difficult on landing, while Su-9 was difficult in the air. Commanders usually mastered it, but flew further on other types of airplanes. Su-9 killed a lot of pilots. Its task was intercept of high altitude targets. It was exceptionally good at the ceiling, but handling characteristics were bad at trans-sonic speeds. I also had a case, which I still remember. I flew it during daytime fine, and it was my fourth night mission. 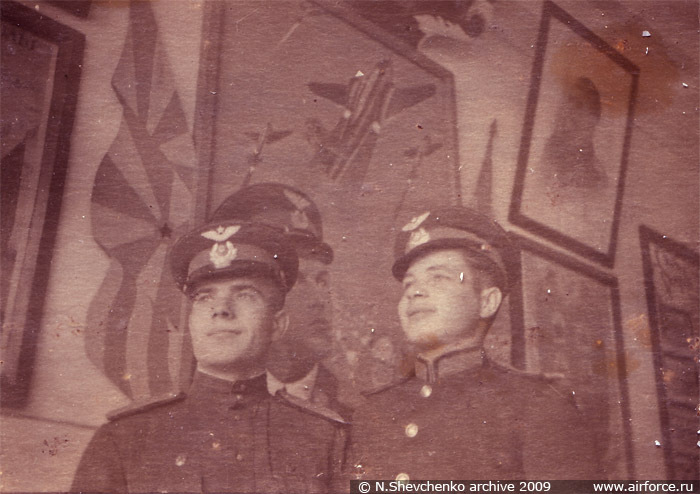 I took off in MiG-17 from Vasilkovo to Zaporozhye � to fly at night, our regiment equipped with Su-9 was based there. From a preflight briefing to take off, usually passed almost 1,5 hours. At first weather was checked: it was good at the moment, but promised to worsen later. I�ll describe it like a spin-barrel, uncontrolled one, of course. I had 2 000 meters of altitude then. � I�m in a spin. Recalled aerodynamics, theory, which I was taught in the academy. And applied correct control input. It stopped spinning in upside down position below clouds... I lost over 1 500 meters in this spin. � What�s going on 601? � everything fine. Approaching to land. Su-9 improved. Some aerodynamic improvements were made and added some fuel. It mainly flew for 30 minutes. And those flights were high altitude intercepts. � When first air-to-air missiles appeared? On this same Su-9 guided missiles appeared for the first time. It carried four missiles and no cannons. � How long were you in Vasilkovo? � Had Power�s flights in U-2 any impact on your division? � How officers thought about Caribbean crisis? What measures of increased readiness were announced? 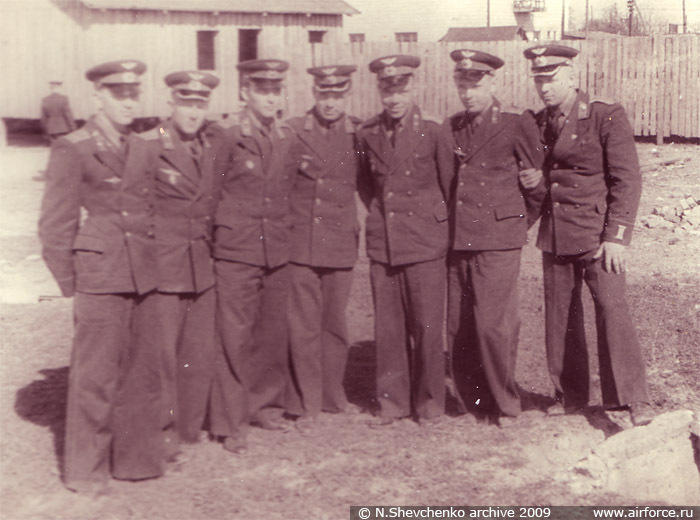 Officers were calm and fully supported Khrushchev, No special measures were imposed. Army is always battle-ready. 19th PVO Division. 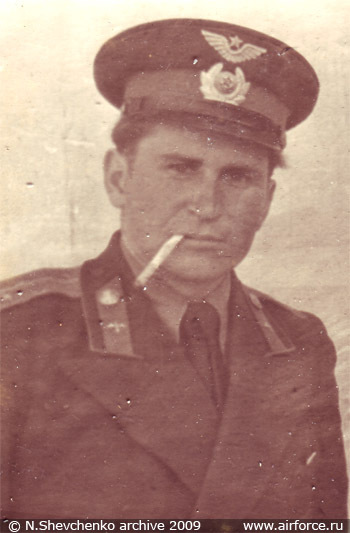 Division commander was General-Major Korotchenko Alexandr. He was a "god son" of Nikita Khruschev. 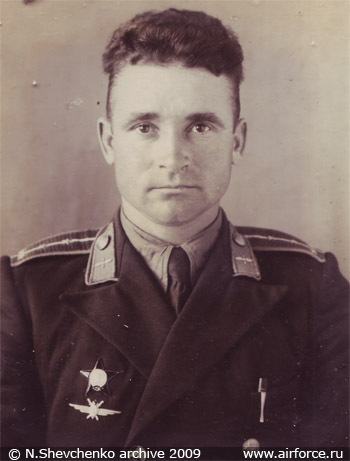 Father of division commander was a chief of Kolkhoz in Ukraine. He suggested me a post of regiment commander in Skomorokhi, but before that I had to be a squadron commander for a while. � Then you became a regiment commander? � We will sign you off on the next year. All this was reported to Marshal Alexandr Pokryshkin, three times HSU, he was a PVO army commander then. I met him when he was still flying, and he knew me well. We flew together in Vasilkovo. There were special airplanes, and all pilots who mastered Su-9 were known to the commanders in person, because it was such a complex airplane. � Were you in hospital due to some sickness? No, it was planned check up. To be sure that a candidate for regiment commander post is fully healthy and has no restrictions in flying. But they did not make note in my medical card about hepatitis, they noted that I should undergo another check up. This meant that some restrictions appeared. In real life it meant that restrictions were spreading not only on pilot, but on his carrier too. I don�t want to describe what was going on there, but I eventually wrote a rapport: �I want to study�. I wrote a complaint at Korotchenko. Pokryshkin summoned me. I told him everything. � This is how you went to study? � I�m not allowed to study. � Then become a teacher. I will talk to Alexandr Ivanovich. If there was no Krasovskii, there would be no Pokryshkin, be4cause HSU Krasovskii was the Air Army commander, where Pokryshkin was a pilot. We needed symbols, and Pokryshkin was such symbol. Who made him? 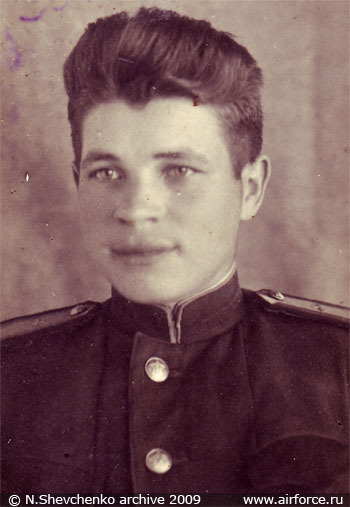 Stepan Akimovich. � I will not go to Sudets. Sudets went to a vacation, and his Deputy HSU, Aviation Marshall Georgii Vasilyevich Zimin signed an order � that�s how I became a teacher in the Academy. � Do you remember Stalin�s death? How people met this news? � Khrushchev�s Army reforms touched you in any way? � On the other hand, maybe you made a carreer due to Khruschevs reforms? � Who will fly, if you will leave? � Were you married then? No, I married when I studied in Academy. When my position stabilized. How I made it to Academy. I wrote to regiment commander. � Where are you going! Who is going to shoot? � I want to go to Academy. � Go, but only �in absentia�. � He wants to go to Academy. � He will not pass. They allowed me to apply, gave me one month to prepare, but without leaving the regiment. At the sports ground I was training at loping, and then it hit me at the legs. I still have scars here. Alexey brought me to the doctor on a bicycle. We had a doctor Ivan Petrovich. He stitched me up. In a hospital I had a month of free time to prepare. I came to Academy with a crutches. But I was the only one to write composition with a �5� mark. Then there were six exams. I passed with �5� Russian language and with �4� physics and math. There were 3 men competing for a place at the Academy. � They will not allow me to stay. � Non of your business. Don�t worry. � There will be an order of Supreme Commander. They still don�t let me go. On the other hand I was accepted to the academy. In the academy I, with help of Stepan Akimovich, was included into flight group. In academy I flew Su-15 and MiG-21. � What is your attitude towards Pokryshkin? I can�t say that I knew Pokryshkin well. But I had thought that he was a wonderful man. 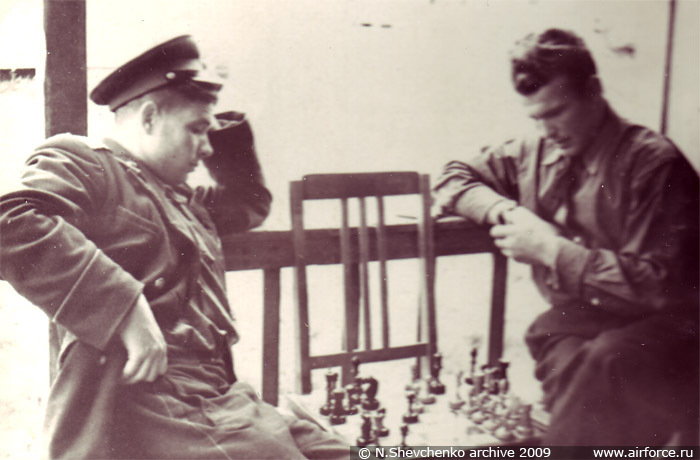 � Did you meet Kozhedub or Savitskii? They are our pride, our national heroes. One three times HSU, another one twice, both are Marshalls of aviation. They cannot be compared, simply unethical, because I know Kozhedub as a student. But I served under Savitskii banner I honor and greatly respect him. He was a commander of PVO aviation with a personal call sign Dragon, and personally, in a special Yak-28 checked alert state of control posts from an altitude of 10 000 meters. Under his personal supervision investigations of accidents and crashes took place, he taught PVO aviation all that will be of use in the time of war. At the age of 56 years he quit flying, and was appointed to the post of Deputy Supreme Commander of PVO for airfield construction and housing. At this post we met at the airfield Bel�bek near Sevastopol, in a recreation facility, at the tennis court. Playing tennis was his main hobby. When he became a commander, at all PVO airfields tennis courts were built. � You were a teacher. What you taught your students about? � Do you know anything about Gagarin�s death? Official version about Gagarin�s death was published in �Russian newspaper� - No 3441 issued on 30 March 2004. � How you ended up in Vietnam? There was heavy fighting then. In Tonking gulf there were two carriers, an armada in Thailand and in South Vietnam. Our relationships with Vietnam were very worm, that�s why our specialists were asked to work there. Those were mainly aviation specialists, or, to be exactly correct, PVO specialists. � Was you sent as a missile or aviation specialists? I was sent as Aviation specialist. � What was your rank then? � And what was your post in Vietnam? � You have two hats, you brought them from Vietnam? � If my country needs, I will go. I agree. � It seems that Vietnamese pilots had more victories while flying MiG-17. First, they had only one regiment equipped with MiG-21. Second � they worked very economically. I don�t know about amount of victories precisely � I well know what was going on at the time of my presence there. Vietnamese fought economically. For example, a squadron of F-105s or A-4s took off from a carrier; they would send a pair on intercept. That was a test of our airplanes. I have to say � MiG-21 very reliable airplane. There was one case of friendly fire, when one of them was hit by our missile, but made it home. Reliable machine. There was no need for Vietnamese in aiming devices on MiG-21. Weapons were used very close. Especially valued was MiG-21 F-13. � What was kill confirmation system? How real were their claims? System was similar to our � questioning of local population and search for wrecks. Wrecks found � kill confirmed, not found - sorry. � Did our pilots engage in the fights? � A fact is known that our instructor was caught in a twin-seater. Yes, I know. But I�m not going to comment on this. � Do you know this fact? I know all facts, because I was there. 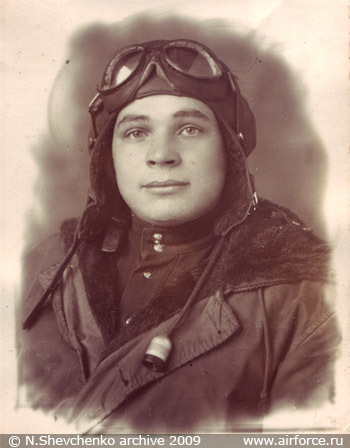 Our pilots were there, trained them, but didn�t fly combat missions. � Were there Soviet specialists killed in Vietnam? According to data provided by Ministry of Defence, from July 1965 till 31 December 1974 total losses were 13 officers. � How real were intercepts of B-52s? It is written that there were several intercepts? B-52s were shot down by SAMs. � Did Vietnamese pilots shot them down with MiG-21? No, I never heard about downing B-52s with fighters. We knew who, when and where. Main victories were against fighter-bombers, that is, against tactical aviation. � Which one you would think of a more dangerous adversary, F-105 or F-4? � Did you collect wrecks to familiarize with new American equipment? Chinese didn�t allow us. We also shot down unmanned drones. There were "BQM" and �127 G�. This one flew at low altitude. Everybody fired at it with all types of weapons. But it was not that easy to hit it. It should be fired at with a deflection. MiG-17s shot them down easily from point blank. They downed it, we gathered wrecks. At those days we were in bad relationship with China. When I was going home I was surrounded by Chinese, they set demonstrations around me, and so Chinese police had to protect me. I returned home just a few days before conflict at Damanskii broke out. Our embassy was on the street that locals called Revisionists street. They called us Revisionists. � Still, what were you doing in Vietnam? So many years had passed, it�s not a secret any more. keeping in mind that Americans used Vietnam as testing ground for new equipment � aircraft F-111, high altitude reconnaissance airplane SR-71, unmanned drones 127j and BQM-34, ECM equipment, new types of bombs and missiles (AGM-62 Walleye, AGM-45 Shrike), tested new tactical ways of interdicting PVO in DRV, marines and Army tactics. Gathered information about these questions was accumulated and sent to the Army. I wrote a book �US Air Force action in Vietnam�. � Americans believe that they inflicted losses to Vietnamese VVS almost surpassing the size of USSR VVS. What was the real loss rate for VVS DRV? I don�t have precise numbers, but simply due to the fact that VVS DRV had very few planes at their disposal they couldn�t suffer numerically large losses. They weren�t catastrophic in percentage also. � You said that there were Cubans there? I�m not sure whether those were Cubans or Koreans, but there was a squadron of non-Vietnamese pilots. And a good one too. � How would you compare Vietnamese pilots to our? Pilots couldn�t be compared to ours. They were physically weaker. Pilot had to be fed better� Airplane demands excellent health condition. � Could they hold G loads? They selected pilots and begun feeding them to the best they could. They flew well. � By the way, how you were fed? � In the end of war the enemy used carpet bombing. How effective it was? I�d say that its effect was 15-20% of the bombed area. � Did Americans have a chance to win if the conflict would have continued? Continuation of the conflict was senseless for Americans. It was mostly air war. There were no American troops on the ground of DRV. � How would you describe American pilots? How can I describe. They had their interests. Their future candidates to the president�s post flew there. John McCain was a pilot in Vietnam. It is prestigious to be a pilot in US. But as I said, 12 men from our Academy refused to go there. In UK prince serves in the Army. For 12 men our State interest was not important. But State honour cannot be measured by money, by salary. � How much did you earn those days? I never chased high salaries. 600 rubles. My wife received 100% of my salary here. � How much was 100%? � Was you married with kids? � Twelve officers refused, you weren�t afraid? At first� I boarded a plane to Irkutsk, then in a passenger liner Il-18 to Peking. By this time I was alone. When I was instructed I was told, that I will be met there. From Peking I was taken by An-2 for 3 000 kilometers to Nanjing, it was an airfield near border. We waited for a night to cross it, because Americans without any hesitation shot down civilian airplanes. During dark time, with lights off we crawled at low altitude to the other side. Getting there was much more difficult than being there. The flight itself was very tense. Chinese kept singing songs about Stalin all the time. They singed, then we drank some cognac, ate who wanted. � How long you were in Vietnam? � Was it a lot or not? It was a lot of time. � How you were dressed when you were going there? In a civilian suit. Everything was given for free. Clothes, dark glasses, towels, medicine. � How you were dressed in Vietnam? The same � civilian clothes. I was sent there for three month, and then my stay was extended for three more month, then "let�s stay till the end". Climate there was very difficult. Very hot. � Were there diseases among specialists? � What kind of diseases? Heart and skin problems. Some where even sent back home prematurely due to health problems. The situation was so difficult, that all advisors and even ambassador Ilya Sherbakov had to live there without families. � Did Americans bomb our embassies? Of course. They claimed that they didn�t bomb civilian targets. But they broke their word and destroyed our specialists living buildings. Americans bombed civilian objects mercilessly despite their own claims. � You stayed in Vietnam for eight month and returned to Academy as a teacher. When you stopped teaching? Until 1996. I taught combat training and safety of flight. � Did you keep flying? Yes. I mastered Su-15. I flew from Chkalovskaya, until one pilot crashed. He landed short of runway, stayed alive, but his plane was wrecked. Then we began flying from Kubinka. I flew Sukhoi and MiG-21 at the same time. Before lunch I had lesson, after lunch I went to the flights. In 1971 I defended dissertation, got a rank of Colonel. Kept working until 1990. At the age of 60 I was discharged from the army. For six years I kept working as a civilian specialist. Thus I have over 30 years of teaching activity behind me. � Could you recall all the planes you flew? Yak-18, Yak-11; La-7, La-9, ULa. Then jets: MiG-15, MiG-17 � this one In all modifications. MiG-17 pure, MiG-17P and so on, MiG-19, MiG-21, S, PF, SMT, now airplane T-3 - Su-9, Su-7 twin seater, Su-15 S. Su-15TM. � Which plane was most difficult to fly?